PLANET in PERIL, your "one-stop shop" for the truth about our planetary crisis. 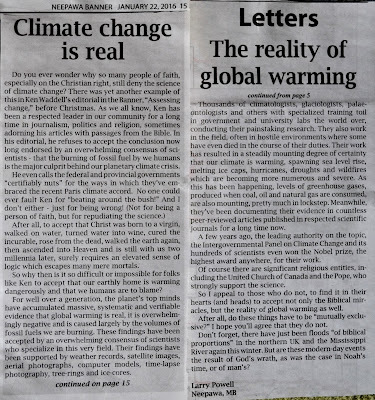 : Neepawa Banner Publishes Controversial Letter Over Religion & Climate Change. 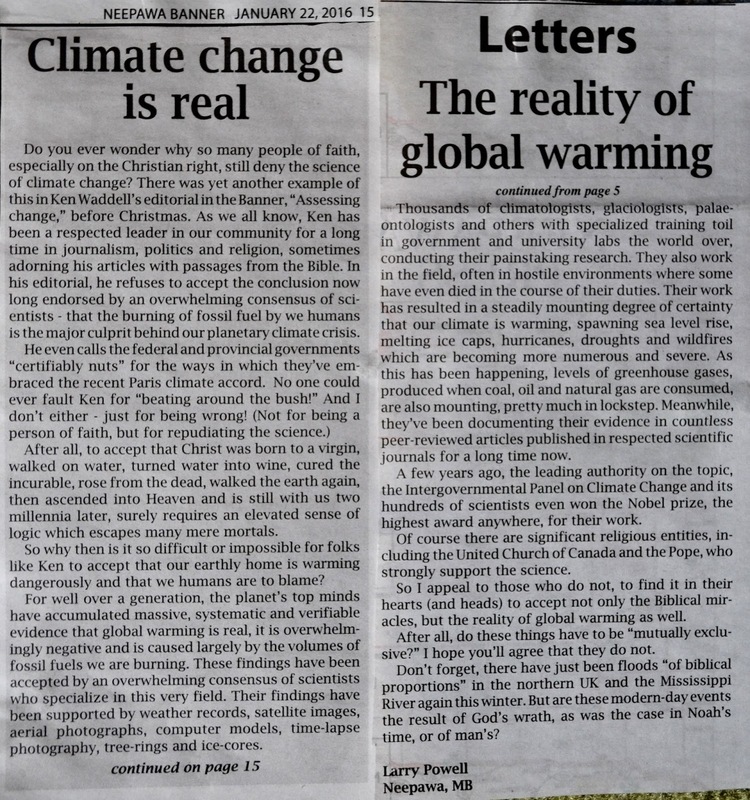 Neepawa Banner Publishes Controversial Letter Over Religion & Climate Change. The publisher of the weekly newspaper, "The Banner" in the Town of Neepawa, Manitoba, Ken Waddell, printed an editorial before Christmas, denying a human cause for climate change. He also criticized methods proposed by federal and provincial governments to tackle the problem as "certifiably nuts." This prompted a letter of my own which challenged his conclusions. I found it odd that a person of faith, as he is often proud to communicate, could find it possible to believe in the truly fantastic stories of the Bible, yet could not find it within his own personal powers of reasoning to accept the now well-proven science of climate change. 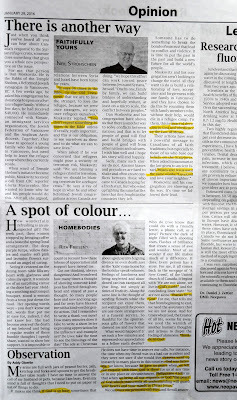 To his credit and that of the papers, my own letter appeared in the January 22nd edition, below. Ken, I suspect that publishing this was not easy for you, as it was not the kind of letter you deal with often - touching, as it does, on both climate change and faith, the latter obviously being of great, personal importance to you. By priniting it, you have taken the high road and shown that you also take the values of journalism and free speech very seriously! Thank you! As my letter points out, it's not uncommon for Ken's stories to be embellished with Bible passages. And every single edition of his paper (as seen, below) contains columns by three different writers - all religious. 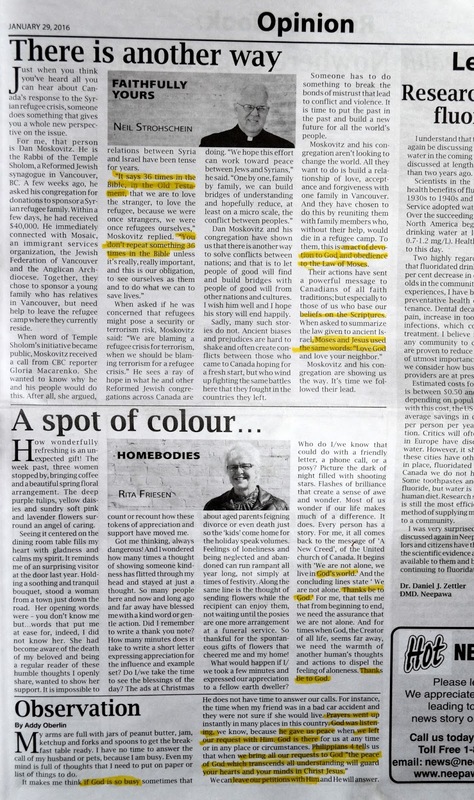 In my humble opinion, if we are to routinely subject many other issues in our society to public scrutiny and debate, such as politics, sports and gender identity, why not religion? Why not hold people of faith accountable to their often controversial beliefs and positions, just like everyone else? This is all I'm attempting to do here. RELATED: "Faith vs. Science. Why Can't We Have Both?" PIP……on climate change,There are none so blind as those who do not wish to see! The scientific truth is overwhelming, but that is something that many are reluctant to believe.